RYANAIR COLLECTED MORE than €1.8 billion through extra charges and add-ons last year – but US-based airlines squeezed more money out of passengers. A new report compiled by American aviation consultancy IdeaWorksCompany suggested that Ryanair was one of the top-10 airlines in the world in terms of revenue generated through add-ons, extra charges and on-board food. In its most recent financial year, the low-cost carrier recorded ancillary revenue sales of over $2.3 billion, or about €1.8 billion at the time its annual report was filed, putting it in fifth position behind four US airlines in the league. US carrier United recorded the highest total ancillary revenue with sales of €4.9 billion. Delta raked in €4.5 billion, American €4.4 billion, and Southwest – which inspired Ryanair’s low-cost business model – recorded ancillary sales of just over €2.6 billion. Ancillaries were worth more than €1 billion to Ryanair’s British rival, EasyJet, which also featured in the top-10. Ancillaries were worth more to Florida-based low-cost airline Spirit, with extras accounting for almost half of the company’s total revenue. Ryanair did not feature in the top-10 airlines for ancillary revenue per passenger, a list also headed by Spirit, which an earned average of €43.76 in non-fare income for each customer. Icelandic low-cost carrier Wow Air, which operates flights from Ireland to the USA and Canada via Iceland, was second on the list, pulling in an average of €41.96 per passenger. Hungarian budget airline Wizz Air also featured in the top-10 with €26.74 per passenger. According to the report published by IdeaWorksCompany, sponsored by Dublin-based travel tech firm CarTrawler, the 10 airlines featured in its ancialliary revenue league table generated a combined €25.5 billion through add-ons. A decade ago, that figure was closer to €1.8 billion. 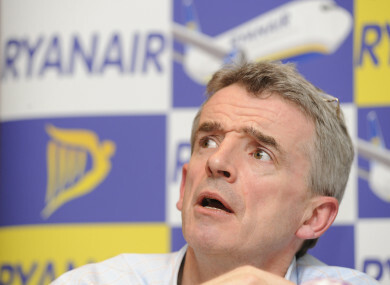 Email “Ryanair collects €1.8bn through extra charges - but it's not the king of the add-on”. Feedback on “Ryanair collects €1.8bn through extra charges - but it's not the king of the add-on”.